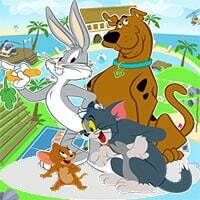 Boomerang Sports is a wide selection of summer-themed games featuring various cartoon characters like Bugs Bunny, Tom, Jerry, Scooby, Shaggy, and more. The games in the sports festival include Basketball Zorb, Beach Pogo and the wet and wild Rubber Ring Race! Get ready to support your favorite character and compete in all three exciting events! Try to win them all and set a new record on each and every sport you participate in! Feel the warm freshness of summer by going to the beach! Join Bugs Bunny, Scooby, Tom, Jerry, and the rest of the gang as they compete in various summer-sports activities! Make sure to check out Boomerang All Stars Super goalie Game. You may enjoy playing it.